The SmartHip™ SPT is a high quality prosthesis that can be used for all the classical indications of total hip arthroplasty such as primary or secondary hip osteoarthritis, rheumatic coxitis, avascular necroses and broken femoral neck. The SPT follows the philosophy of Orthopaedic Innovation to offer clinically proven designs to our International distributors. The grit blasted stem of the SPT is made of titanium alloy according to ASTM F136/ISO 5832-3 by forging. The titanium raw material shows excellent biocompatibility features with its elasticity module closest to that of real bone, whilst also offering high fatigue strength. When used in conjunction with cancellous bone grafts this prosthesis is a very efficient alternative, especially in revision surgery when the available bone amount is limited and cement usage is not appropriate. It can also be supplied with a hydroxyapatite (HA) coating if required, a finish which has superior osteoconductive features that accelerates bone growth on the stem. 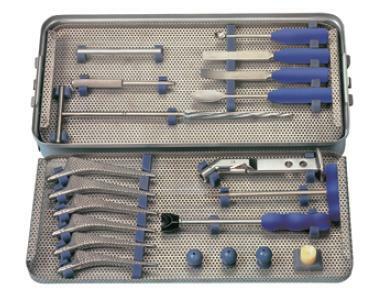 Includes: Modular Rasps (7, 8, 9, 10, 11.25 and 12.5 mm), Medullary Reamer, Modular Rasp Handle, Rasp Bar, 3 Test Heads Ø 28mm (S, M and L), Gauge for Femoral Head, Repositioning Lever, Repositioning Lever Synthetic Top, Repositioning Top, Stem Impactor, Femoral Head extractor, Spoon Curette, Curette, Guj Curette, Straight Chisel, Curved Chisel, 2 Hohmann Retractors (I and II).